1. K.R. Andrews, "Christopher Newport of Limehouse, Mariner," William and Mary Quarterly 3d ser., 11, no. 1(January 1954):28. 2. Conway W. Sams, The Conquest of Virginia, The Third Attempt 1610-1624 (New York: G.P. Putnam's Sons, 1939), 83. 3. Alexander Brown, The Genesis of the United States, vol. II (Boston: Houghton Mifflin and Company, 1890), 956; Philip L. Barbour, The Complete Works of Captain John Smith in Three Volumes, vol. I (Chapel Hill: University of North Carolina Press, 1986), xliv; Brown, Genesis, 956. 5. Ibid. ; Barbour, Complete Works, xliv. 6. Brown, Genesis, 957; Barbour, Complete Works, xliv. 7. Sir Leslie Stephen and Sir Sidney Lee, The Dictionary of National Biography, vol. XIV (London: Oxford University Press, 1959-1960), 356. Andrews, K.R. "Christopher Newport of Limehouse, Mariner. "William and Mary Quarterly 3d ser., 11, no. 1 (January 1954): 28-41. Barbour, Philip L. The Complete Works of Captain John Smith in Three Volumes, Vol. I. Chapel Hill, NC: University of North Carolina Press, 1986. Brown, Alexander. The Genesis of the United States, Vol. II. Boston: Houghton Mifflin and Company, 1890. Sams, Conway W. The Conquest of Virginia, The Third Attempt 1610-1624. New York: G.P. Putnam's Sons, 1939. Stephen, Sir Leslie and Sir Sidney Lee, eds. The Dictionary of National Biography, Vol. XIV. London: Oxford University Press, 1959-1960. While information about Christopher Newport is limited, the Library has a packet available - just email your request. Other books, listed below, are available in the library and for purchase. 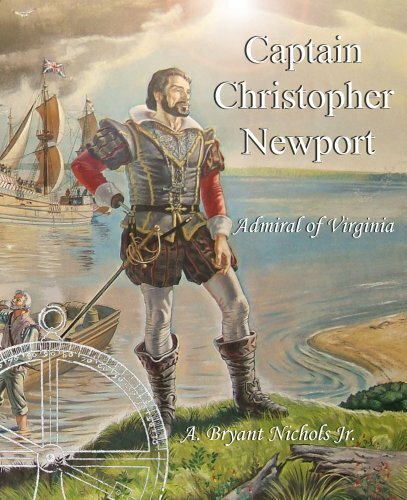 Captain Christopher Newport by A. Bryant Nichols, Jr.